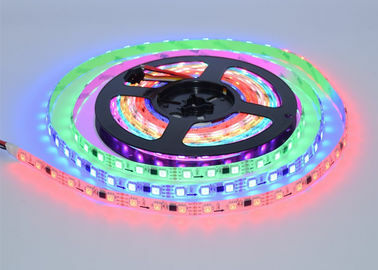 12V Magic RGB LED strip light color changing can be flashing, fading and chasing, red, blue, green auto change. Dream color led strip has 133 different changing patterns and changing speeds, great to use in home, garden office and shops decoration etc. - Installation environment must be smooth, clean and dry. - The part of LED components can not be fixed on the surface of the sharp edge. - Please follow the cutting line when you need to cut the light ribbon. - Power Supply/IR Remote Control are included. - No longer than 5m when it is used in a DC series circuit.